I decided to ease my way into nonfiction this year with Monica Dickens’s One Pair of Hands. Reading it was only partially in keeping my with 2013 reading resolutions, but it was something to start me on the nonfiction path (where I would hopefully continue until I found myself reading some piece of narrative nonfiction that my brother-in-law might enjoy). Upon further investigation, I discovered that Academy Chicago was simply reusing the illustration by Dione Tegner used on the cover of the 1961 Penguin edition. Still, one asks oneself, why that illustration, and why with the orange border? It’s somehow less offensive on the 1961 Penguin. Well, if ever there were a time not to judge a book by its cover, that time is now. 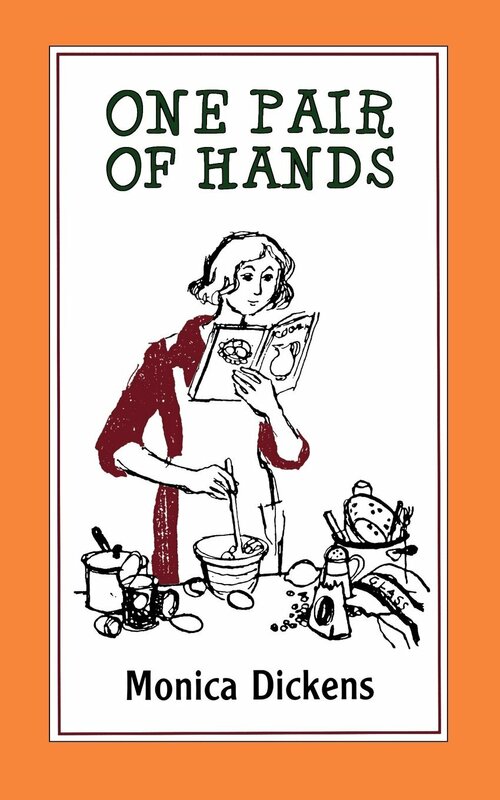 One Pair of Hands tells the story of how, after being expelled from drama school, Monica (a great-granddaughter of Charles Dickens) eschewed the debutante’s life of parties and chose instead, on the sole experience of a few cooking courses, to try her hand at being a cook-general. The ensuing stories of life in service, Monica’s various failures and successes and the unreasonable demands of many of her employers, are a hilarious glimpse of life below stairs, and rather more Gosford Park than Downton Abbey: you won’t meet a benevolent butler like Carson in these pages. You will meet one or two fallen soufflés, the rare considerate employer and the more common inconsiderate one, tremendously amusing anecdotes, and one failed actress with considerably more self-confidence than I’ve ever had, who created a role for herself and brazened out the performance to its conclusion, which, all told, makes for highly entertaining reading. This entry was posted in Books, Reviews, and Reading and tagged 2013 reading resolutions, books, memoirs, Monica Dickens, nonfiction, One Pair of Hands, questionable book covers on May 6, 2013 by ms.grammarian.